How preschoolers are affected by media is important to their overall health and development. This tip sheet will help you understand how media can positively and negatively affect how they think, act, learn and grow. 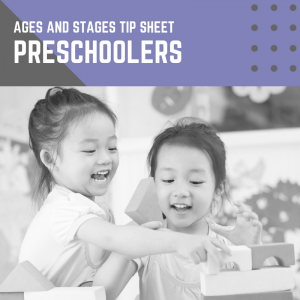 Use this information as a guide to help you choose media that are best for your preschooler. Educational shows for preschoolers can improve their language skills, critical thinking skills, and social skills. Choose educational programs made for preschoolers, such as Sesame Street, Dora the Explorer, or Daniel Tiger’s Neighborhood. Preschoolers are not yet able to tell the difference between fantasy and reality, and may be scared or confused when watching videos. Watch shows and movies first, or read reviews to help you choose content that is best for your child. Advertisements can influence preschoolers’ food choices. Limit commercials by using ad-free streaming services, or by fast-forwarding through commercials. Listening and singing along to music can help preschoolers develop their language skills. Choose instrumental music, or music with preschool-friendly lyrics that your child enjoys. Reading can help preschoolers develop literacy skills, including spelling and understanding what they read. Choose books written for preschoolers and that your child enjoys. The Entertainment Software Ratings Board (ESRB) rates video games based on content. Games that are rated for Early Childhood (EC) or for Everyone (E) are usually well suited for preschoolers, but some may still be too scary or violent for your child. Play through video games first, or read reviews before allowing your preschooler to play. There are many entertainment and learning-based apps aimed at preschoolers. Choose apps for your child based on their likes and learning needs, such as a drawing app, memory quiz, or nonviolent game.